Here is the next in my Faces of Love shelter animal series. His name is Joe. Don't worry, you won't need your tissues for him. Joe is a lively and friendly beagle that came to the shelter seeking a new home. 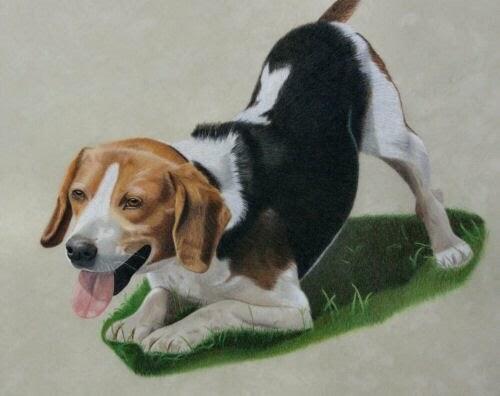 As you can see from the painting, Joe is a fun little dog who loves kids and a good romp in the grass! He was a very popular dog at the shelter during his stay, and thankfully did not stay long. Soon a loving family came and fell in love with Joe and adopted him. He now lives in a good home. I might be making a few tweaks here and there on some things I've noticed in this pic, but it's pretty much finished. And, yeah, I'm still toning down the grass a bit. Told ya I can't do grass. Brenda Mattson gave me a tip on what to do to help me fix the grass. It's working, if I can just do it right. I need some more pencils. I ran out of kelp, one of my favorite colors (and no there is no kelp in the grass, but there should have been).